Made from High Density Polyethylene fiber, a flexible & highly durable material that helps prevent injuries to birds. One inch mesh is recommended for quail pens. Two inch netting is for pheasants and larger birds. 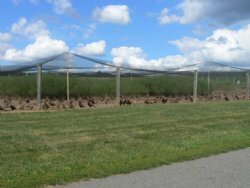 Our netting is available in multiple strengths for all weather conditions. Browse these categories under "Aviary Netting"
Featured products under "Aviary Netting"